As babies move into toddlerhood, some no longer tolerate the car seat. 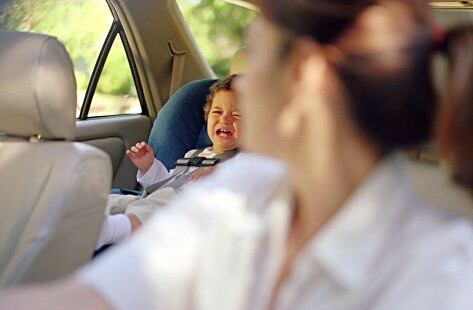 A screaming toddler is a distraction to the driver and a child that escapes the car seat is not safe. Here’s what to do if your toddler hates the car seat. Toddlers are able to understand simple concepts and instructions. Sometimes all it takes is to explain why it is important to ride in the car seat. Reinforce the idea before every trip. “Now remember, we’re going on a drive so you have to buckle up in your seat”. Be consistent and make it clear it’s not negotiable. One mother on Circle of Moms shared how she pulled the car over each time her youngster unbuckled himself and would only continue driving once he buckled up. It took several journeys, a few missed birthday parties, and sitting alongside the road for up to 45 minutes but he eventually got the message. Distraction works wonders with young kids. If you have older children, enlist their help. Older siblings can help soothe and comfort a crying toddler. They can also distract a distraught toddler by making silly faces, showing picture books, playing games, or tickling them. Crying may soon turn into giggles and chatter — music to any parent’s ears. Chest clip guards, like the one from Merritt car seat manufacturers, prevent kids from sliding down the chest clip and is lockable so that kids cannot unclip it. Buckle guards stop kids from unbuckling. Mittens are a simple trick for younger toddlers — provided they can't pull the mittens off. Parents of special needs children face a tougher challenge. Children with sensory disorders may find the car seat straps unbearable. Those with autism or attention deficit hyperactivity disorder (ADHD) can be disruptive in the car. The RideSafer travel vest is ideal for children with special needs. Amie Durocher, Child Passenger Safety Technician at Safe Ride 4 Kids, explains why the vest works well for autistic children. “The RideSafer vest feels like a weighted vest kids with autism commonly use," she said. "They find the hug-like feel comforting." In some cases, kids with special needs are uncomfortable in a traditional car seat. Amie says the RideSafer travel vest provides better restraint and comfort. The snug fit and additional tether strap keep kids with poor motor control in an upright position. “One mom reported her son who has cerebral palsy screamed for 6 years every time they went anywhere. She switched to the vest and the change was immediate. He now loves riding in the car, “ says Amie. 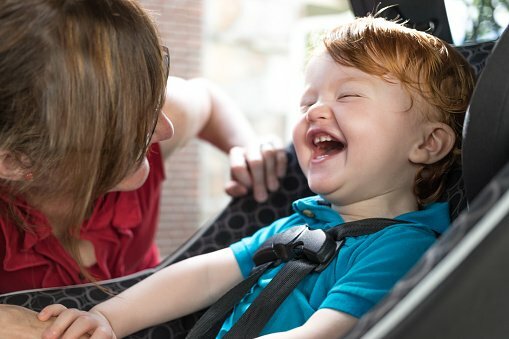 The car seat is a source of conflict for many parents and toddlers. With some patience and persistence, you can win the battle. Keep calm during the tantrums, praise the good behavior and remember that this difficult phase will pass.